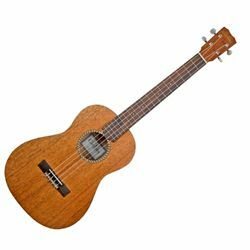 This is a sweet sounding baritone ukulele. A clean and simple look in the classic Martin mahogany style. Very deep tone! We "dress" or level and re crown the frets every time on this model. This makes a huge difference in sustain and the ability to get low action. By the time it gets to you, you will wonder how this can be so affordable. It's just a great deal. For a $200 Baritone with a solid mahogany top and a custom setup, it can't be beat!